Watching people leave the McDonald’s drive-thru got me thinking about customer retention, and addiction. I’m currently in Bozeman, MT as part of the Gamerati Tour 2011. Because there was no event today, I had the pleasure of eating dinner… alone. Unlike Phoenix, the weather here is cooperating, so I decided to cop a squat outside the local McDonald’s and enjoy myself. 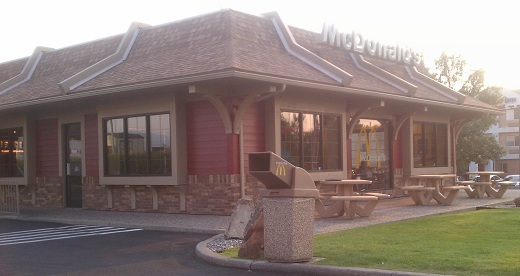 As you can see from the picture (above), the tables are in clear view of the drive-thru exit and the trash can that every McDonald’s franchise seems to have. While I enjoyed my meal, swatting at the pair of bugs that wanted in on the experience, I watched five vehicles exit. Every one stopped at the trash can and deposited various-sized bags and drinks containing the McDonald’s logo. While I applaud their use of the trash can, and the fact that McDonald’s places it so conveniently, I’m assuming these people weren’t throwing away the meals they just purchased. It was clear that these people were throwing away the bags and drink containers from their last visit to the Golden Arches. How can we make products that are as habit-forming as McDonald’s? (1) Consistency over time: This doesn’t help the start-up, but it’s important to note the obvious fact that McDonald’s has been around around 4EVAR! People know what to expect from McDonald’s, which is a draw. (2) Convenient availability: As of today, there are 31,000 McDonald’s franchises, worldwide. I seem to recall that, next to the Vatican, McDonald’s in the largest owner of real estate in the world. That may seem like it doesn’t apply to you, but it does. Think about game stores, for instance. One reason game publishers should care about the health of the game retailer is because they provide a convenient place through which games can be made available. The internet doesn’t count in all cases. Many people buy online, but there is a percentage of the gaming customer base that will only buy at a local retail store. If there are no stores, they just won’t buy. Furthermore, game stores act as ‘gaming franchises’ – familiar locations that people associate with their routine, where they can pick up new gaming goodness and drop off stuff they no longer want. (3) Customer value: I don’t think anyone will say that McDonald’s serves food on par with a home-cooked meal. They don’t try. They give you food that is fast and cheap, something hungry humans on the go find valuable. I’m not saying that everyone should use the same pricing strategy – far from it – but you should give an appropriate level of value for the price you charge. (4) Consumable goods: A Big Mac is, in every way, a consumable good. Can you make a product that gives good value, but has to be paid for over and over again, in order to be enjoyed? A number of companies do. For example, my favorite is Gaming Paper; for only $4.00 you get an awesome roll of graph paper for your tabletop RPG or war game and it’s a product retailers can sell to you over and over again. Brilliant! I’m sure there are more, but these four things should get the gears turning in your head. Can you make a consumable product that gives good customer value, and can you deliver it consistently through convenient means? This entry was posted on Tuesday, September 13th, 2011 at 04:08 and is filed under Featured. You can follow any responses to this entry through the RSS 2.0 feed. You can leave a response, or trackback from your own site.